Two Bay Area mayors want a second opinion on the cracked steel beams at the Salesforce Transit Center. Mayor London Breed and Oakland Mayor Libby Schaaf on Thursday jointly called on the Metropolitan Transportation Commission Thursday to “assist in evaluating” the cause of those two cracked beams. If the slow transportation grind is getting you down, you may want to check out this forum that will attempt to find some solutions to the failing systems that are plaguing our fair city as we tilt, sink, and fall into the future. The Forum will address increasing congestion on San Francisco’s streets and the deterioration of public transit service. The Muni carries roughly the same number of passengers in 2018 as it did a decade ago despite increasing city population and the continuing economic boom. What can be done to make it easier to move around the city? The Forum features four presentations by transportation experts who will share their ideas for reducing congestion and improving public transit service. Jonathan Hopkins, Executive Director of Commute Seattle will describe how his city has been the only one in the nation to increase transit ridership since the recession. Jerry Cauthen, Former Senior Engineering Manager and Transportation Vice President, ParsoVisit Sitens Brinckerhoff, will talk about ways to improve public transit service and ridership in San Francisco. Mollie Cohen D’Agostino from the Institute for Transportation Studies at the University of California at Davis will share results of her group’s study of the transportation networking companies (Lyft and Uber) in San Francisco and other American cities. Bob Feinbaum, Chair of Save Muni will describe the role for congestion pricing in San Francisco, aided by a video featuring Jonas Eliasson, head of transportation for Stockholm which adopted congestion pricing more than a decade ago. These presentations will be followed by a moderated discussion of questions from the audience. Come and share your ideas to make San Francisco truly a city where public transit comes first. Doors open at 9:30 AM. Please come to the Grove Street library entrance and tell Security that you are here for the transportation forum. Coffee and snacks will be available at the small cafe opposite the auditorium. The $2.2 billion Salesforce Transit Center is expected to remain closed at least through the end of next week after inspectors found a second cracked steel beam beneath the center’s rooftop park, officials said Wednesday. A bad week for public transportation in San Francisco this week has lead to a bad week for everyone’s commute. Will the voters rebel against the failed agency or will City Hall finally say ENUF and abandon the failed agency? Item 8. The Motivate Bike Share program, discussion, and possible action. Your Attendance is critical if you care about the Commuter Shuttle Program, your two minutes of public comments are appreciated on this as well. If you can’t make it to the meeting and want your voices and opinions taken into account, send your letters and comments to the Board of Supervisors and the Mayor and the candidates for office who are running for the new Board positions. Use the authority in Ordinanace 180089 to demand a hearing and an audit of the programs before any further erosion of our public access on our public streets is allowed. Let the officials know how many empty GoBike stations you see in your neighborhood. Photo of late night GoBike truck at a station on Bryant and 17th Street shot by zrants. The first order of business for SFMTA is to support the needs of Muni riders. How are these programs solving Muni problems and why are staff spending so much of the taxpayers’ time and energy supporting the corporations in their efforts to take over our public streets? Here are some questions that you may want to ponder as you review the material. What is the ratio of bikes to GoLive Stations and how much money has SFMTA collected from the GoBike program to date as part of the pubic/private enterprise arrangement? Will the contract that was signed with Motivate be extended to Lyft when the ride-share purchases GoBikes from Motivate? How have other cities dealt with these issues? Should private shuttles be able to use Muni-only lanes? MTA says yes — but the public can weigh in Tuesday. San Francisco transit planners have been working for years on a proposal to create bus-only lanes on Geary Boulevard. It’s called Bus Rapid Transit, and the idea is that – since we (unfortunately) don’t have a subway line underneath the Geary corridor, we can do the next best thing by creating lanes just for Muni. Activists have discovered that Muni’s current proposal would allow not only Muni buses but private shuttles, like Chariot and the Google buses – to use the city’s public transit-only lanes. The national press has been covering the anger and actions against privatization of public streets for years. SF Board of supervisors passed Ordinanace 180089 to give voters some control over access to curbs. There hearings on the horizon along with the Controller reports we have requested for months. What does SFMTA do? Blame Muni for the slowdown and hand over more traffic lanes to private enterprise, not covered by the ordinance. while spending hours of staff time developing an elite program for corporate e-bikes, and deserting vast numbers of Muni riders during the largest transit crisis in years. Must the public demand the removal of Reiskin and a vote on a Charter Amendment to roll back SFMTA autonomy to get relief? Will Mayor Breed appoint a strong new MTA Board Director to the current regime at the SFMTA Board, who will return Muni’s attention to making Muni an attractive reliable functioning option? You can only pretend the emperor is dressed for so long. It is hard to take a bus that does not arrive to pick you up. It is past time to replace the leadership at SFMTA. Coalition for San Francisco Neighborhoods will sponsor a forum on the Scott Wiener legislation that is shaking up the state of California. This will be a great opportunity to learn the real facts behind SB 827 and other controversial attempts to change the way California cities are developed. Find out why people want to protect the local planning process now controlled by our local communities. Speakers: Art Agnos, Former SF Mayor; Zelda Bronstein, Former Berkeley Planning Commissioner; Calvin Welsh, Affordable Housing Advocate; Sophie Maxwell, Former SF Supervisor. Co-sponsors include: West of Twin Peaks Council, Noe Neighborhoods Council, SF Neighborhood Network, Van Ness Corridor Neighborhoods, Stand Up For San Francisco, Livable California. Please come and bring your friends! Please RSVP as seats are limited. Map of effected areas in SF indicates 96% of the city property will be up-zoned if SB 827 passes. (1) Demolition Protections: The up-zoning SB827 imposes will accelerate demolition of existing housing. Wiener amended his bill to incorporate language that local demolition laws will remain. (2) Anti Displacement & Eviction Protections: SB827 would lead to developers evict low income tenants building developments that would be offered at higher rents that would displace low income residents. In February 2018 Scott Wiener made amendments to the bill in an attempt to address these amendments. These amendments are invalid and ineffective for the reasons described below. “Rent-controlled housing may not be considered for demolition permits unless a local government certifies by resolution, after the passage of SB 827, that the city will consider demolition permits for rent-controlled housing based on criteria and processes set forth in the resolution, and affirm that every displaced tenant will have a Right to Remain Guarantee (#4). After the resolution passes, the city retains full discretion to deny, restrict, or limit issuance of these permits in accordance with its policy. Currently, the Planning and Building Code for demolition controls are routinely ignored as evidenced by illegal demolitions that continue to take place. Case in point is J.K. Dineen’s article from January 7 of the Chronicle that featured 3 homes. We have many more that have yet to be ajudicated. The additional height and number of dwellings offered by SB827 will incentivize more demolitions in a city that is already plagued by illegal demolitions. All moving expenses for tenants moving into and out of interim dwellings are paid while the project is being built. Up to 42 months of rental assistance that covers the full rent of an available, comparable unit in the area is provided. Right of first refusal for housing units in the new building is guaranteed, including new lease at the rent previously enjoyed by the tenant in their demolished unit. a) Developers Can Easily Circumvent These Provisions: In reality, “renovictions“, buyouts, and Ellis Acting will occur long before any application for permit is filed. Because Planning does NOT check whether or not an address was previously tenant-occupied, developers can get away with this. Planning doesn’t keep an inventory of rental units and as such, cannot identify what property is renter-occupied. b) No Agency is Accountable to Enforce the Provisions: What agency would provide the oversight for any of the so called displacement protections? Who is going to enforce the right to return for tenants that have to move out? Who would determine what a comparable unit is? Would something in Antioch be comparable for tenants in the Mission? A city that has a heck of a time enforcing its current Planning and Building Code will not be able to administer unenforceable requirements such as these ones. c) Unscrupulous Use of Construction Delays: All construction cycles are unpredictable by nature. Delays happen all the times because of the market or developers who just want to get the entitlements and then sell them to the next developer. What if the build cycle goes beyond 42 months? When does the clock still ticking on that 42 months? From the time that the developer applies for permit or from the time that the construction begins. It’s easy for unscrupulous developers to game the system and drag the permit and construction process to go beyond 42 months. (1) Invalidly presumes market rate developers will build enough units to stabilize or reduce rents. This invalidly presumes trickle down (now referenced as “filter down”) economics work, and markets are efficient. It ignores that increasing units generates additional demand from speculators and a continuous flow of new employees to the region. (2) Removes local decision making imposing a one size fits all mandate that overrides local considerations such as environmental issues (E.g. nature preservation, risk of flood, fire, etc…) and local issues (e.g. capacity of transportation infrastructure, local services such as police, fire and schools, etc…). We respect that California is facing a housing crisis and advocate solutions focusing on providing truly affordable housing that respect local and environmental considerations and that protect communities of color and low income communities. Send edits, additions or suggestions to comments for consideration. BART’s oft-delayed trains look downright speedy next to the painful pace of housing development around its stations. Take the affordable-housing complex Casa Arabella, the second phase of which broke ground on a parking lot near Oakland’s Fruitvale Station last week. The occasion, as The Chronicle detailed, arrived nearly a quarter-century after plans for the area transit village took shape. Housing around BART stations and other mass-transit hubs, as it turns out, isn’t so different from housing throughout California: disdained by surprisingly plentiful, powerful and vocal constituencies and therefore in all too short supply. And yet neighborhoods served by train stations are among the most logical places for high-density housing development that won’t compound traffic and pollution. Chiu is aligning his political future with Wiener’s. They appear to be taking their marching orders from the YIMBYs and their developer backers instead of listening to their constituents. Chiu’s AB2923 would force development on BART parking lots. Wiener’s SB 827 and its cousins, if passed, will impose state zoning on all of California’s local governments. Both are extremely unpopular with citizens around the state and neither of these bills have been vetted by their constituents, or the local governments they are being imposed upon. 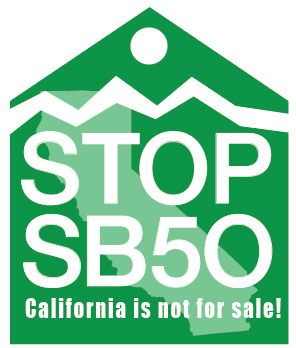 Cities and counties around the state are opposing SB 827. After the last decade of government by developers, we have no less traffic, cheaper housing, or happier citizens. We have more workers with longer commute times, thousands of displaced people living on dangerous crime-ridden streets, and the highest cost of living in the world. Our local businesses are closing and the disruptive on-demand delivery industry is at a crisis point, as delivery services do not perform as promised. The effects of the entire SMART plan need to be evaluated before we continue down this path. If you oppose dense stack and pack development, attacks on private vehicle ownership, and/or the state takeover of local jurisdictions, you may want to vote for some new representation in Sacramento when you get the chance. Stay tuned for details on how you can fight back. Taking aim at climate change, highway gridlock and soaring housing costs, a California lawmaker has ignited a red-hot debate with a proposal that would force cities to allow more apartments and condominiums to be built a short walk from train stations and bus stops. The war against cars is finally exposed as the cover for the great new gold-rush land grab that it is. If there was ever any doubt about the connection between public transportation projects and housing, SB 827 lays those doubts to rest. Sensitive neighborhood communities in California cities have been pushed out of their affordable homes, and businesses that served them are closing. The lucky ones escaped to the suburbs, the unlucky ones ended up on the street. If SB 827 passes, the residents who moved to the suburbs will once against be uprooted. Where are they supposed to go next? Read the article and the sidebar that describes the intent of SB 827 and decide for yourself how it may effect you and your neighbors. Opposition is growing around the state to forced dense development as residents from San Diego to Mendocino dispute the one-size-fits-all approach to zoning and the top-down approach to governing. The construction industry does not live and die by legal edict. When the physical limitations of production are taken into a account it is easy to see why it takes so long to build. You need money, labor, and materials as well. The insane pace of building has driven costs through the roof. The process is broken and doing more of the same thing is not going to fix it. Let your city officials and state representatives know how your feel about the state telling you and your neighbors how you must grow your cities and towns to meet the expectation of developers intent on expanding their portfolios by rapidly increasing land values without regard to the consequences.